Combines patented HUSH technology with a noise-gating process. 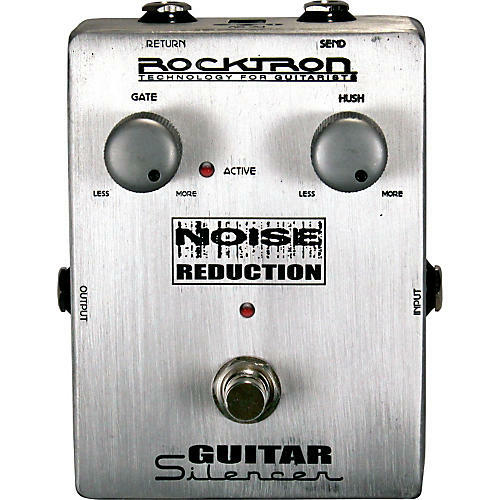 Now you can achieve noise exterminating bliss with Rocktron's Guitar Silencer stompbox that combines patented HUSH noise-reduction technology with a noise-gating process. This combination of two noise eliminators creates one effective noise-killing device. No matter what style of playing you do, from pop to metalhead madness, the Guitar Silencer is your Swiss Army knife for wiping out hiss and silencing awkward changes in your music. The Guitar Silencer allows you to go from heavy, all-out distortion to complete silence by muting your guitar strings. All without changing your tone one bit. There are times when your music calls for single-ended noise reduction; that softer version of noise elimination that allows your sustain to ring out unaffected, while getting rid of creeping hiss and circuit noise. That is what Rocktron's patented HUSH does so well. Then there are times when you want hard noise-gating to chop the ends of your notes while achieving instant noise kill, first achieved in metal by Dimebag Darrell with the original, rackmount Guitar Silencer. This stompbox version provides both of these noise-reducing methods in one simple pedal that takes up minimal space on your pedal board. Part of the Rocktron Boutique Series of stomp boxes, the Guitar Silencer comes in a rugged metal chassis with eye-popping, retro, custom-designed laser-etched artwork. True bypass, and as a bonus, you can use it to add true bypass to your favorite distortion pedal using the Send/Return jacks. Controls for the Guitar Silencer include GATE, which is the threshold at which the noise gate portion of the effect will clamp to silence. The HUSH control determines the threshold of the noise floor you want the HUSH portion of the effect to reduce. An active LED lights up when the gate threshold has been met. The Guitar Silencer runs on a 9V alkaline battery, or with the optional Rocktron DC OnTap universal power adapter (Product #158004).